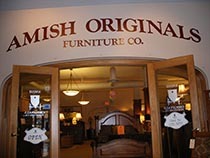 If you are looking for a quality furniture store near Columbus, Ohio, look no further than Amish Originals Furniture Co. in Westerville. Here you will find the best selection of items for every room in your home from some of the most trusted furniture manufacturers in the world, the Amish. Sure, you could go to a department store or other furniture stores, but you are not going to find the quality that you will find here. The Amish take great pride in their work, and it shows in the items that they manufacture for us. When you buy furniture that has been mass produced, you are going to get furniture that is made from inferior quality products. Our furniture store Columbus, Ohio sells only products made by the Amish, and they use only the finest North American hardwoods for everything they make. You get to choose the type of wood that you want your furniture made from, so you can get a look that is uniquely yours. Unlike mass produced furniture, these are all items that are going to stand the test of time and look great for many years to come. We like to think that we are a part of the community, and our involvement in community activities is just one of the reasons why Amish Originals is the most popular furniture store near Columbus, Ohio. We are also environmentally conscious, as are the Amish people who build all of our products. At Amish Originals, you will receive the best customer service in the industry. We will make sure that you are able to find everything you need at prices you can afford. If you have any questions, our knowledgeable and experienced sales associates are always there to help you with your selections. Not only do the Amish use only the best hardwoods for the furniture they build, they craft each piece with a love that is not going to be found in any factory. In fact, you will not even find any power tools in an Amish workshop. Each piece of furniture they build is made by hand, and with a precision that you just can’t get with power tools. This means that every item you find in our store will be unique, and not something that you will see in every other house you visit. There are plenty of furniture stores you can go to, but the best furniture store near Columbus, Ohio you can go to for the best deals on high quality, Amish-made furniture is Amish Originals Furniture Co. You will find furniture for every room in your home, as well as everything you need to furnish your outdoor space. If you are unsure about what you need, our knowledgeable sales associates will help you to make the right purchases so you will have furniture that you are happy with for many years to come, perhaps even for generations to come.